No one calls it a "second hand store" anymore. 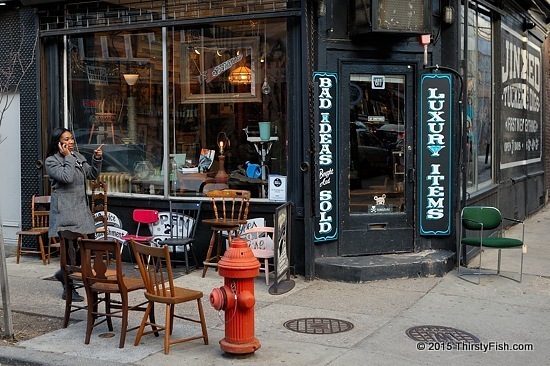 This is the storefront of "vintage" clothes, books, furniture "art" store named Jinxed in Philadelphia. In an earlier post, I wrote about a most ridiculous remark by Harvard Professor Steven Pinker: "It's really hard to think of any war fought over resources". I thought to myself, who would buy into such a preposterous idea. It turns out that Steven Pinker is actually taken seriously in many circles. His broader thesis - which he argues using pseudostatistics - is that, thanks to civilization, trade and literacy, violence is steadily decreasing in the world, and that we are in an age of "Long Peace". That is absurd. A recent article by John Gray obliterates Pinker's argument, and Nassim Nicholas Taleb brings down Pinker's statistical foundation. Both well worth reading. The "free trade" of bad ideas by "academics" and "intellectuals" must be banned! Or there should at least be consequences. I absolutely have no authority to accuse the likes of Steven Pinker or Sam Harris of intellectual dishonesty, but they seem to understand that "controversy sells". And sadly, bad ideas are either taken seriously by some, or used in sinister ways to justify malice by others. Irrespective of what their motives are, those "selling" obviously unsubstantiatable bad ideas under the guise of "science" should be punished. Economists who promote or implement policies on the assumption of "infinite economic growth" are either disingenuous or idiotic or both. It doesn't matter which, they should never be in a position to shape policy. Academic institutions should demote those engaging in scientism. Any evidence of cherry picking, whether intentional or negligent, should be treated as scientific misconduct. "Intellectual idiots" are dangerous!